You are bidding on one space in the ASBA Conference Workshop described below. Are you new to botanical art or not entirely confident in your drybrush watercolor skills? Beginning or veteran botanical painters, we’ll refine your abilities while aiming for increased precision and hand comfort. After completing some work sheets, we will paint a pansy. Note:You must be a current member or ASBA to participate in the workshop. 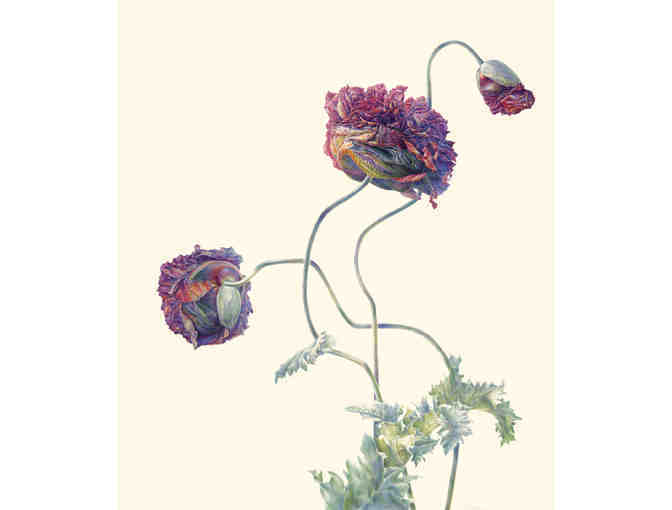 An avid gardener, Jean Emmons has 2 gold medals and “Best Painting of Show” (London, 2011) from the Royal Horticultural Society and the 2005 ASBA Diane Bouchier Artist Award for Excellence in Botanical Art. NOTE: Image shown is an example of Jan Emmons's artwork and not for sale at this auction. IMPORTANT, PLEASE READ: A workshop space purchased through the auction with a winning bid may be purchased as a gift for an ASBA member but may not be resold. To use the workshop space, an individual must register for and attend the ASBA Annual Conference in St. Louis. In the event the winning bidder is not able to attend the conference for any reason and does not wish to give their space away, the base workshop fee will be refunded "if" the workshop space can be filled by a paying ASBA member from a waitlist. Any amount of the winning bid above the published value for that workshop will be retained as a donation to ASBA. Any request to assign the space to another member or request a refund must be made by the close of conference registration. Your support matters, so American Society of Botanical Artists would like to use your information to keep in touch about things that may matter to you. If you choose to hear from American Society of Botanical Artists, we may contact you in the future about our ongoing efforts. Copyright © 2003-2019 American Society of Botanical Artists and BiddingForGood, Inc. All Rights Reserved. Designated trademarks and brands are the property of their respective owners.